Cabling | Welcome to Connecticut Arborists! In some instances a tree will develop with co-dominant stems, usually two but sometimes three or four. When this happens it presents a structural weakness, often leading to breakage during a storm. To help reduce this possibility we can install high strength cables in the tree’s crown. The requisite standards need to be adhered to of course, but proper cabling can be a big help. 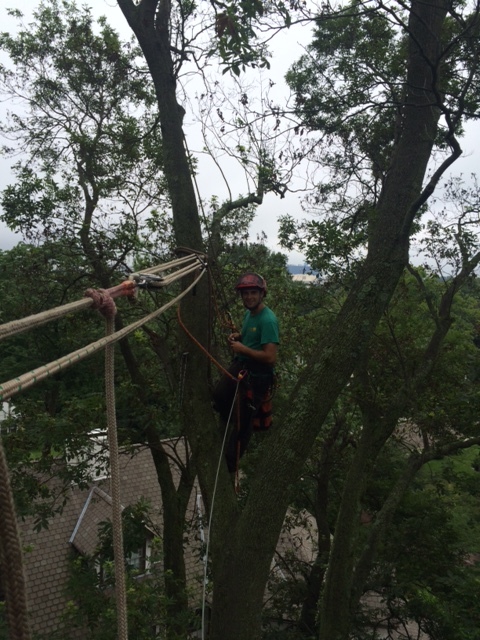 Here the arborist is using a block and tackle system to hold the tree sections together. Then he’ll install a single, strong cable to be left permanently in the tree.